We went 2-0 with 1 push last night, even though all 3 were close calls. Our winners were on the Stars, who beat the Wild in OT, and the Flames, who survived a third-period comeback attempt by the Leafs to win 4-3. We pushed our Best Bet on the Flyers/Ducks Over 5, thanks to an empty netter by the Ducks late in the third. A 2-0-1 night, but close to being a 1-2 night. Just goes to show you the fine line between winning and losing in NHL betting, and why it’s so important not to get too high during hot streaks and too low during cold streaks. We’ve had two 0-3 nights in the last few weeks, but we’ve also gone 23-11 on Best Bets this year and 14-4 on Totals. The bottom line so far this season is +13 Units, which is a number we’re VERY pleased with. We’ll try and make it a little better tonight with 1 betting tip from the 3 games in action. By the way, we’ve been getting a few more questions about games lately on Twitter, which is great. If you’re unsure about a game or want to bounce an opinion off us, tweet at us. 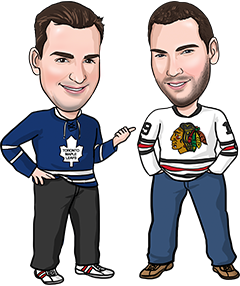 We’re currently working on a few instructional videos about NHL betting that we’ll be posting on Twitter as well, so it’s worth following us for that too. Or you’re always welcome to chime in with your picks and predictions in the Comment Section below. This is a pretty tough spot for the Canucks, who played last night at elevation in Colorado. Both Edler and Sutter were injured in that game, so fatigue will probably hit the Canucks players even harder as other players have to play more minutes. Ryan Miller will start in net for Vancouver, but he’s 6-9 with a GAA near 3 on the road. The Coyotes are in a big slide, going 2-6-2 in their last 10 games. Most of that can be explained by a brutal schedule. Over their last 7 games, Arizona has faced the Kings (twice), Blackhawks, Ducks and Sharks – all teams that have been pretty hot lately. Now they get a chance to face a sub-.500 division rival that is tired. The Coyotes should see this as a very winnable game they can’t afford to let slip away. Bet this game at BetOnline – 25% Free Play to $1,000!